Trinity offers a wide variety of services for your South Florida parking lot. From installations to repairs and maintenance, we do it all. All material furnished meets Florida state specifications. 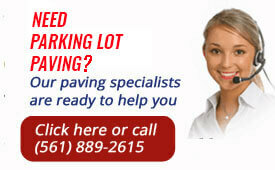 Call us at (561) 889-2615 for a free quote on your parking lot paving project. If you need a new parking lot or to improve or want to revamp your existing parking lot anywhere in South Florida, from Weston to Boca Raton to West Palm Beach our company can help you achieve your goals. We start by drawing up plans for your parking needs to accommodate proper number of parking spaces and drainage plans. We than get all our elevations and boundaries marked. The following step is to start the excavating process by land clearing, demucking, and installing 12” of well compacted subgrade and then installing 6”-8” of DOT certified road base depending on engineers recommendation. Then we compact the road base to reach 98% density with the proper roller for the job, anywhere from a two ton vibratory roller to a 15 ton static roller. The next step is to apply an asphalt prime to the rock to ensure proper adhesion. 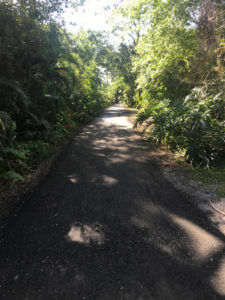 After that we will install 1.5″ of SIII Hot Asphalt and compact it with a smooth drum asphalt roller. We start by removing any loose particles and debris from your existing asphalt pavement by way of motorized blowers and manual brooming, treating any vegetation growth with a highly concentrated herbicide. Our next step is to saw-cut and remove any tie-ins or high spots you may have (this saw cutting and asphalt removal will happen any place where asphalt meets sidewalks, walkways or curbs). At this point we will pre fill any low lying areas to bring them to proper grade. The next step is to ensure proper adhesion and eliminate the mirror effect (when cracks reappear at a later date) by applying a SSIH tack oil bonding adhesive. After that we will install 1.5″ of SIII Hot Asphalt and compact it with a heavy smooth drum roller. Millings parking lots are very popular with our storage yard and equestrian clients in Davie, Wellington and other parts of South Florida. We use a double crushed (popcorn) millings in our installations, which is an ultra fine form of millings. We start by marking out where you would like your parking lot, then we excavate what we need to reach proper elevations. Once we have the sub-grade set we install the millings approximately 4”-6” thick. The popcorn millings are then fine graded and then wet and compacted using a 3-4 ton roller. This is an economic, ecofriendly, alternative to paving. The crushed millings is softer on horses hooves and allows more comfort and care for your precious animals. It is also beneficial for parking heavy equipment and vehicles to an area that cannot be paved for whatever reason weather it be cost or function-ability. When you want a concrete parking lot in South Florida, the first step is to dig out the existing terrain. We will then form to proper height and pour your slab with a minimum of 3000 PSI concrete with added Fibermesh (2500 is standard) for reinforcement. The concrete will then get a trowel or broom finish depending on customers preference. Whether you require new curbing around your South Florida parking lot and landscape islands or just want to repair the existing curb, our company can do it all. Normally we install a standard D curb (12” in the ground 6″ above) but we offer a wide variety of gutter curb, and valley curb. From Delray beach to Davie, from Loxahatchee to West Palm Beach, call (561) 889-2615 for a free quote. 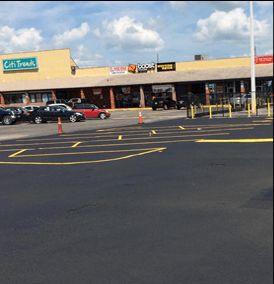 Typical asphalt maintenance should consist of a seal coating to your asphalt parking lot. This service will add years to the life of your asphalt pavement. We use StarSeal Supreme coal tar emulsion with an additional 2% Macro+ Additive (Macro+ Additive improves durability and longevity while enhancing color). We start our seal coating process by removing any loose particles and debris from your existing asphalt driveway, by way of motorized blowers and manual scrubbing. Than we treat any heavily saturated oil spots prior to coating We then apply, one to two coats of our StarSeal Supreme sealer depending on the quality of the existing pavement. There are two different application methods that include brush or spray application. One of our experts here at Trinity can help you decide what application best suites your asphalt and financial needs. When we find a driveway with cracks less than 1/4″ we like to offer Black Beauty aggregate. This wonderful product helps close in minor cracks and helps extend the life of your black top, saving you thousands of dollars from future repairs. Black beauty is mixed with the asphalt sealer and than a thick slurry coat is than mopped on to pavement. When asphalt has cracks greater than 1/4″ we recommend a Hot Crack Filler. Hot Crack Filling utilizes a rubberized tar that is heated to 500 degrees than poured into cracks it is also used to bond loose surfaces together to help extend the life and integrity of your asphalt. This service should be used in conjunction with seal coating for proper maintenance. This service will add years to the life of your driveway as well as save you thousands of dollars for future repairs. Sometimes the cracks are too large however and either patching with hot asphalt or a complete overlay is recommended, one of our asphalt specialists will review your options with you. If you have a pothole or damaged asphalt or ponding area or deteriorated aggregate then parking lot asphalt patching is recommended. We will either saw cut and remove the damaged asphalt prior to replacing or apply a solid layer of tack oil bonding agent and do a tack patch. We will compact the hot asphalt than cool it down for immediate traffic. We install and will replace parking lot car-stops and we offer the standard concrete bumpers along with the rubberized stops. 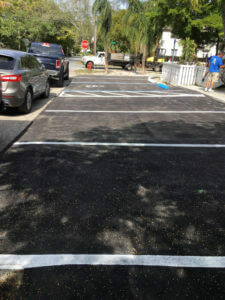 We will re stripe all existing pavement markings or re design your parking lot up to your South Florida county specifications ( Dade, Broward, Palm Beach, Martin etc. ) using a high quality DOT CERTIFIED acrylic paint. we also will paint and number your car stops and curbs. We offer a thermo plastic hot paint that is used on highways and entrance ways that will have a 10 year striping paint manufacturer warranty! We offer a wide variety of street signs and poles. Whether you need to inform people of a speed bump, stop sign, one way traffic or where the handicap parking is Trinity Asphalt Paving can furnish and install all your signage needs. Our company also offers asphalt and concrete maintenance. Call us at (561) 889-2615 FREE for a free quote on your South Florida parking lot project. Trinity Asphalt is founded and conducted by Judeo-Christian principles. Colossians 3:17"And whatever you do in word or deed, do all in the name of the Lord Jesus, giving thanks to God the the Father through Him." 6643 Royal Palm Beach Blvd.